Hi Peeps! Happy Easter, I hope you are all having/have had a wonderful easter. 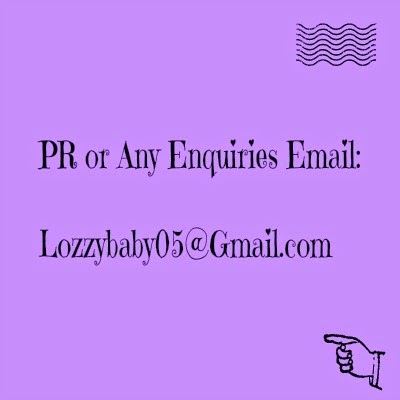 Let me know what you are getting/got up to in the comments. 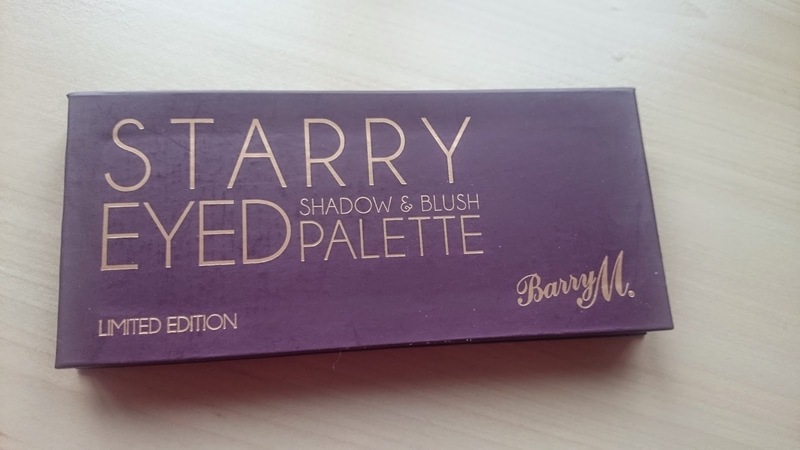 This is, as you can see, a limited edition palette But it is still available in Superdrug here and is £4.49 on offer at the time I wrote this. The Palette itself is in cardboard packaging which makes it nice and light for carrying around but maybe not the most durable material. It's a nice purple colour (my fave colour) and It looks nice enough. There is a mirror in the lid, not full sized as it's got a cardboard frame and it contains 6 Shadows and a blush. As you can see, there are 6 shades. There are 3 matte and 3 shimmer. The pigmentation is actually best on the Matte shades, I found the dark blue and the dark purpley brown (last shade) to be the most patchy/least pigmented. 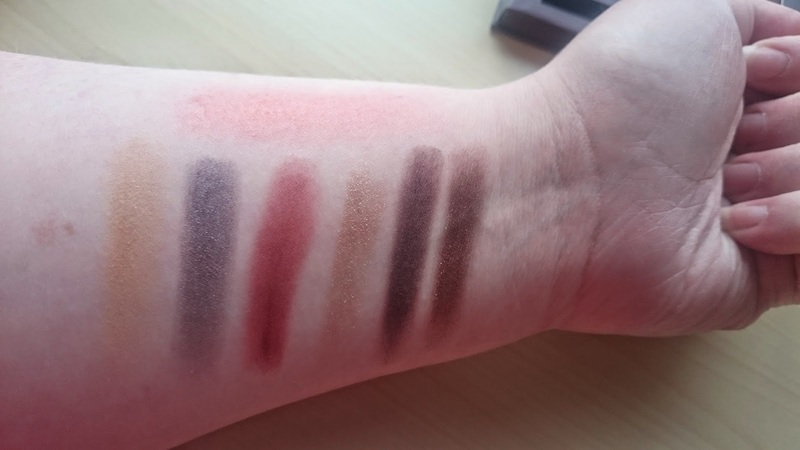 The Mattes are a little chalky and a tiny bit hard to blend, as you find with most budget eyeshadows, but they are definitely workable and do translate well on the eyes. 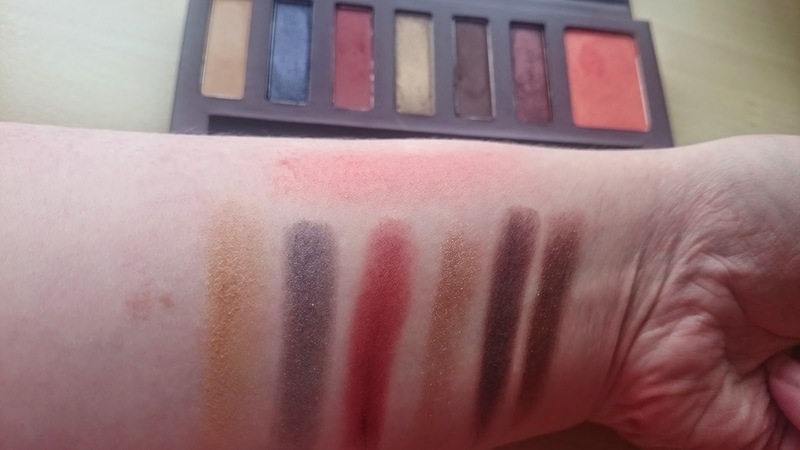 The strongest eyeshadow in pigment is the eyeshadow that drew me to the palette- the red one in the middle. When applying to the eyes, use a light hand. 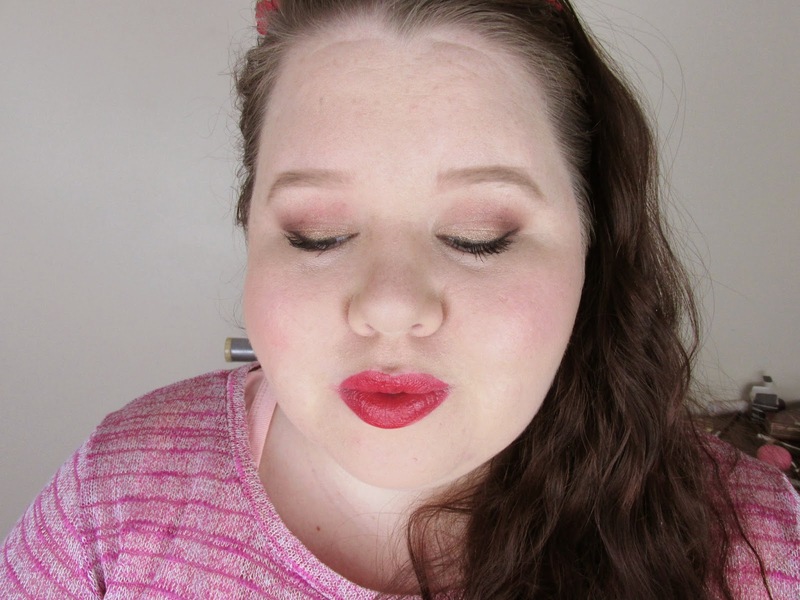 It blends out really nicely and I am loving it on the smokey eye I created with this palette. 2) The Darker, shimmery colours were a let down, especially the blue. I love that the palette comes with a blusher. This is such a lovely, summery peachy orange blush with gold shimmer. The shimmer isn't too chunky either which makes it nice and glowy and right up my alley. 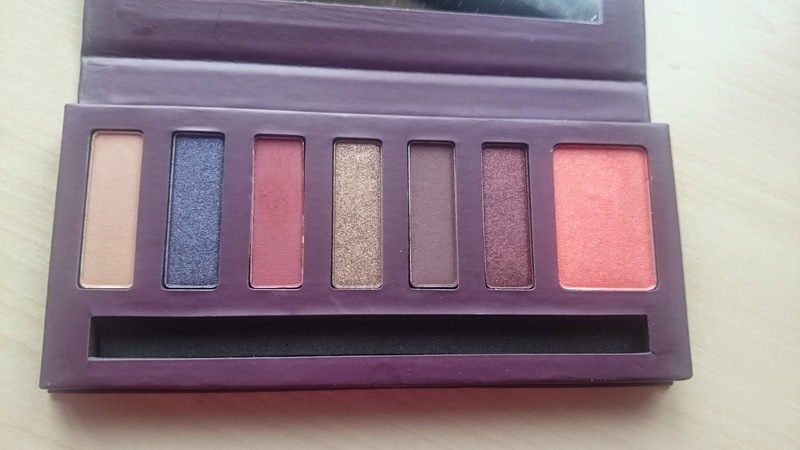 It is pretty pigmented but I used it with my MUA stippling brush and it gave a gorgeous amount of colour. I really liked it- can you tell? 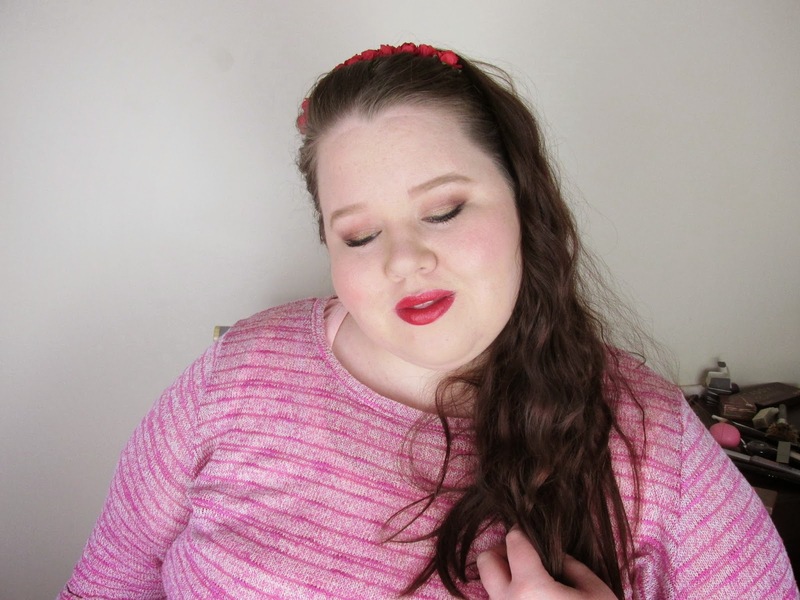 Here is the look I created with the Palette. What do you think? I think it would be perfect for a summer night/evening. All in All I quite like the palette, especially for the price. There are both good and bad bits but all in all it's a nice, handy wee palette and I'll definitely get use out of it. UPDATE: I've been wearing the eyeshadows for around 6 hours at time of typing this and they are sill the same as they were when I applied them.